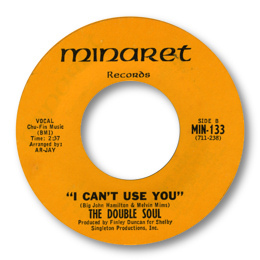 The Double Soul were Elmore Morris and Charles Cooper, and although they only had one release under this name both artists recorded other material. Morris – a cousin of B B King – cut several 45s under his own name and Cooper was the male half of Chuck & Mariann. Of Morris’ early R & B 45s I like the subtle blues ballads “Darling Depend On Me” and the brassy What Can I Do For You on which he really sings hard, in the style of his label mate Bobby Bland. In the 60s the easy rocking It Seemed Like Heaven To Me is the pick of the bunch due to commitment he puts into the vocal. But none of these tracks can hold a candle to the Minaret 45. Their version of the old warhorse Blue Diamonds is amongst the very best, but the intensity of I Can’t Use You is something else. The playing of the AGP group is as flawlessly executed as ever. The midpaced “Unfinished Sympathy” which first appeared on a Japanese LP in the 80s is fine as well. Double Soul – a superb duo. Just wish there were more cuts. Note ~ “I Can’t Use You” and “Blue Diamonds” can be found on the Kent UK CD “Southern Soul Showcase” (CDKEND 243). Both of these tracks and “Unfinished Sympathy” can be found on the Sundazed CD “A Fine Time” (SC11153).